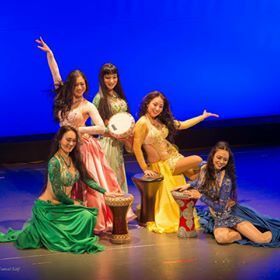 Aida Style sewes oriental costumes for belly dance groups for adults and children. By group costumes, we mean 3 or more, that are going to be similar or same. Prices for group costumes come with big discounts and are very affordable. Price depends on the model of costumes, fabrics (expencive exclusive fabrics, or our usual sateen/shiffon fabrics), type of decorations, and, amount of stones. We will calculate the price for your order before actually sewing it, and you can always decide if you want to shrink price more or, maybe, make your group costumes for belly dance richier and more expensive. Aida Style sewes group costumes for oriental dance only per order, and to individual measurements. We take pride in our costumes being convenient and comfortable to wear. It will fit good, it will be convenient, and, of course, it will have unique design and beautiful look.